Feature Unlocker - this is first addon for the new version - Minecraft Pocket Edition 0.14.0! With it in the game will be new items that developers decided to hide from players - the camera and ender pearl. You can find all of new items in the creative inventory in the first tab. Scroll through to the bottom and there you will find new items. 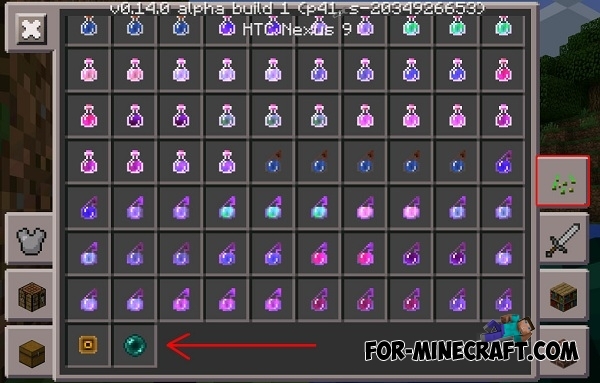 Ender pearl can be used as a item for teleportation. You just need to take it in your hand and hold on the screen. Camera - the oldest exclusive item in MCPE, which has appeared in the very first version of the game but was removed in update 0.8.0. And as you can see, the camera was again returned to the 0.14.0. When you place the camera on the ground, it will be similar to the camera of the 19th century. You can use it as a creation of screenshots but unfortunately at the moment, if you use it the game just freezes and crash.